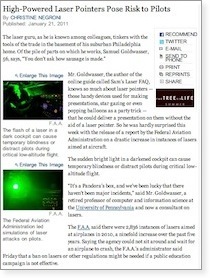 A January 21 2011 New York Times article describes how “High-Powered Laser Pointers Pose Risk to Pilots”. Author Christine Negroni discusses how laser light can distract pilots, the number of incidents in the U.S., and what steps are being taken. The article extensively quotes Samuel Goldwasser, author of Sam’s Laser FAQ, regarding laser technology. Goldwasser is quoted as saying that poor regulation by the U.S. Food and Drug Administration is a problem. From the New York Times. Readers of the Times article may also be interested in clarifications, tips and links compiled by LaserPointerSafety.com.